We offer industrial IP video surveillance solutions including industrial video encoder/decoder, IP camera and user friendly IP surveillance software. Our industrial video over ethernet products are designed to meet strict industrial surveillance standards and well suited for traffic surveillance such as railway and factory monitoring. Our video system allows real time, full-motion feedback as traffic situations develop, whether at a major freeway or within a moving train. New Power Over Ethernet (PoE) model adds simplicity and convenience. Pan, tilt and zoom provide area coverage and the finest details. 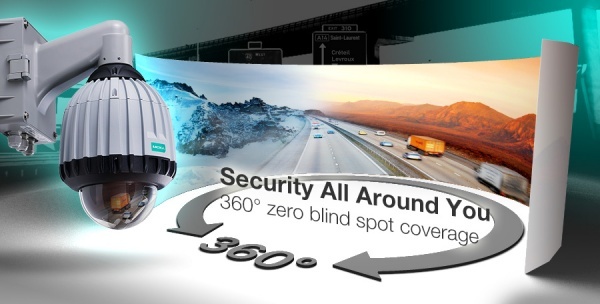 360° pan and -6° to +96° tilt means zero blind spot coverage, and the preset positioning function allows constant monitoring of the most critical areas. Designed to operate in harsh, wide temperature environments. Provides better anti-shock and anti-vibration capability, supports a higher EMC level and comes with important industry certifications. With 1080P resolution at 60 FPS, the VPort 66-2MP features low lux sensitivity and uses 3D DNR, sense up, and ICR technology to overcome poor lighting conditions. Images can be displayed in a wide dynamic range of dark to light conditions. Supports ready-to-use NVR and VMS software for video surveillance systems, and provides a variety of software integration tools for use with third-party VMS and SCADA software. Supports industry standard ONVIF for simpler and faster integration.